"A standing ovation and a curtain call before the intermission is not usual in Aruba, and indeed unique. 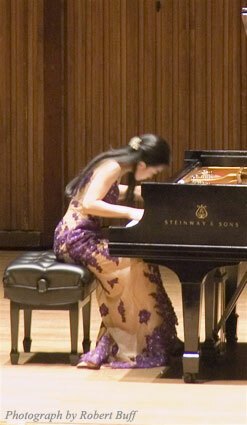 This was rightly and thoroughly deserved by the young Taiwanese pianist Jung Lin..."
"... Jung Lin from Taiwan ... The complete Chopin Preludes were performed with great feeling for color, balance, touch, and just about everything these preludes require from a performer. My award for excellence goes to the third of the preludes, which had the etherealness of a butterfly. Cortot once described the 17th in A-flat as: She said to me: "I love you." In Jung Lin's playing one could almost sense this feeling. The drama of the final prelude in D minor was there to the full, all the way down to the last three fortissimo D's in the subcontra octave, which make your spine tingle. All of it played with great perception."